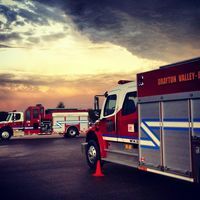 The Province of Alberta has announced that Drayton Valley’s Early Childhood Development Centre has been chosen to participate in a pilot program that will offer child care at the rate of $550.00/month based on the provincial grant standard of $25.00/day. The full announcement can be viewed here. The staff at the Early Childhood Development Centre view every child as a mighty learner. 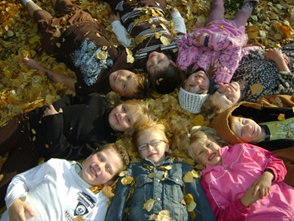 Our program ensures that we value children who bring body, mind and their whole being into their exploration and play. Their learning is robust, awe-inspiring, powerful, and meaningful in how they develop into a strong, resourceful capable citizen. To ensure we provide this learning staff are working with Grant MacEwan to become fluent in the Flight–Curriculum Framework practices. Be sure to stop and ask to read a learning story or check out staff planning to see how we are incorporating these strategies into our daily program! 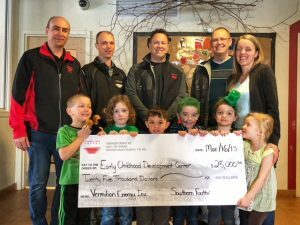 Vermilion Energy recognizes the important role that quality early childhood development plays in poverty reduction and prevention. We are excited that they will be continuing their partnership with us and providing funding for our V-Powered Kids program! The ECDC is celebrating 10 years of providing care to children in the community. Read the ECDC 10 year anniversary newspaper to learn more about milestones achieved over the last 10 years. The ECDC would like to acknowledge and thank the generous companies who sponsor programs at the ECDC and the contributions they make to support families and children at the Centre. Click here to read more about the programs and the companies who support them! The ECDC has Child Care Spaces Available! Year round, for children ages 12 mos – 6 yrs. Monday- Friday 7:00 am – 6:00 pm. The child care centre is closed the week of Christmas for yearly maintenance. The centre is also closed for THREE Professional Development Days in the year. (These dates are announced in the September newsletter to parents). Check out our Child Care FAQ. The Drayton Valley Early Childhood Development Centre is accepting registrations. 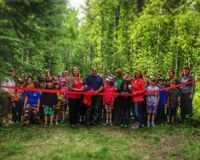 To find out more about the ECDC contact the Program Manager at 780.514.2248. 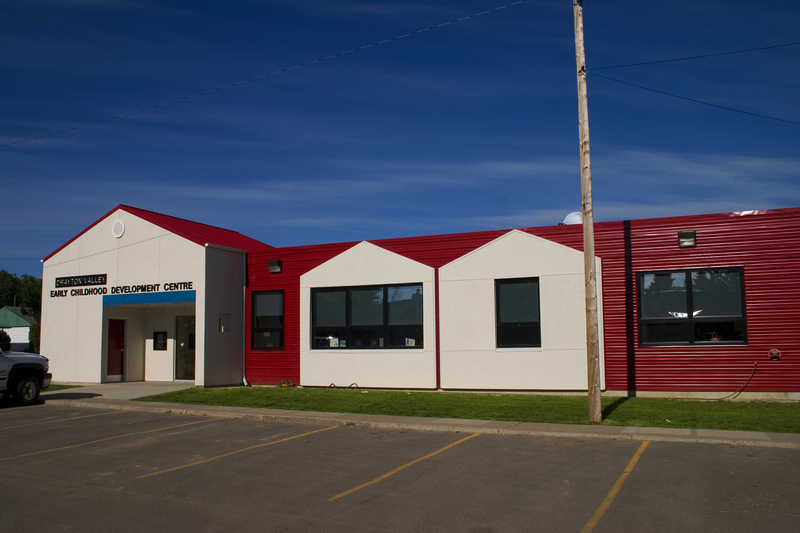 The Drayton Valley Early Childhood Development Centre is located in the heart of our community. You will find it nestled amongst a playground, Splash Park and the Park Valley Pool. Our Centre provides a safe and caring family atmosphere reinforcing our vision and goals. To give the child optimum opportunity to experiment, explore, and discover for himself / herself as much as possible in the environment. To mobilize community resources to provide additional required care for children served by the Centre. services and programs for direct service providers, child care organizations, educational institutions, government policy makers and public opinion leaders. 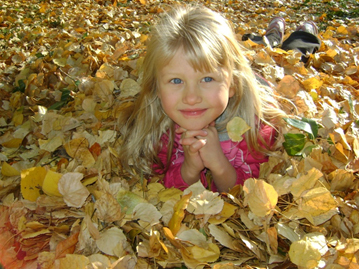 resources on children and families with an extensive library of online documents in the areas of children and families. fosters social and emotional competence and early literacy skills and attitudes in children three to five years of age while providing professional development for their educators.